Learn what triathletes and distance runners have known for years: no-tie laces are not only convenient, but they make your shoes far more comfortable. The elastic moves and stretches with you rather than binding like standard laces do. 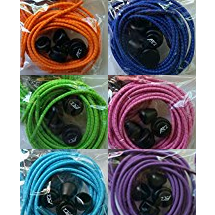 Once you start using these laces, you'll never go back. 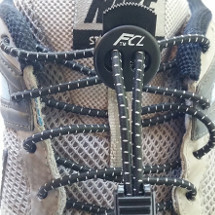 Re-lace shoe with Fast Compete Laces. Squeeze lace lock and insert ends of lace through holes. Put on shoe and slide the lock to achieve desired tension. Slide plastic bell onto laces, larger side facing away from lock. Tie a knot in lace about 2 inches below lock. Cut lace below knot and slide bell to cover knot. Cut laces about 2 inches below lock. Slide lace ends through middle of plastic clamp. Snap clamp shut on lace ends.